The most recent car booking in Wasserburg has been made on our website 4473 minutes ago. In Wasserburg, we offer for rental 4+ car categories from 2+ rental suppliers. 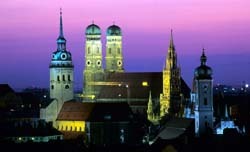 OrangeSmile.com combines car offers from absolutely all rental suppliers located in and around Wasserburg. As an aggregating system, in Germany we are able to provide reduced rental rates that are, in most of the cases, lower than you can get from the suppliers. The search form above allows you to find these offers in Wasserburg on any desired period. You can also specify a return location in Germany different from the pick-up place. The maximum rental period is 30 days. The cars for rent presented in the search results for Wasserburg are just example models for each specific offer. Unfortunately, for Germany we are not able to tell in advance which specific car model will be given at the desk. Rare vehicle types, such as convertibles, sports cars, large off-road vehicles or minivans are available in Germany mostly at airports. If you are looking for such a car type, please check the airports nearest to Wasserburg. We wish the most exciting discoveries while driving around Wasserburg! The building of the comfortable Laimer Hof am Schloss Nymphenburg looks more like a miniature castle with thin and tall turrets. The opening of the family-run hotel took place yet in 1886. The hotel has changed significantly but managed to keep the atmosphere of homelike hospitality. The hotel has more than 20 guest rooms with individual design and a beautiful beer garden. Some original decorations can still be found in rooms, for example, beautiful wooden ceilings and massive furniture made of dark wood. Does the idea of living in a beautiful old villa sound appealing to you? If so, book a room at Villa am Schlosspark . The tiny hotel is open in the silent and picturesque area of Obermenzing. The villa is surrounded by a lush garden. To the service of guests, the hotel offers spacious rooms with high and narrow windows. Colorful furniture in the style of previous centuries is the basis of the design. In the shadowy garden of the hotel, there are many beautiful zones for relaxation. Charming wooden benches are installed among lush flower beds, and, in accordance with traditions of the past, there are old clay pots with flowers along parkways. In summer, the façade of the building is nearly almost covered by winding flowers. Villa am Schlosspark is an authentic old villa with elegant and calm décor.